German Talmudist; born at Frankfort-on-the-Main Dec. 2, 1790; died there Dec. 2, 1847. Being both a man of means and very retiring, he refused to accept the office of rabbi, and referred to the local rabbi any halakic questions submitted to him. He took, however, a very active part in the religious movements of his time. 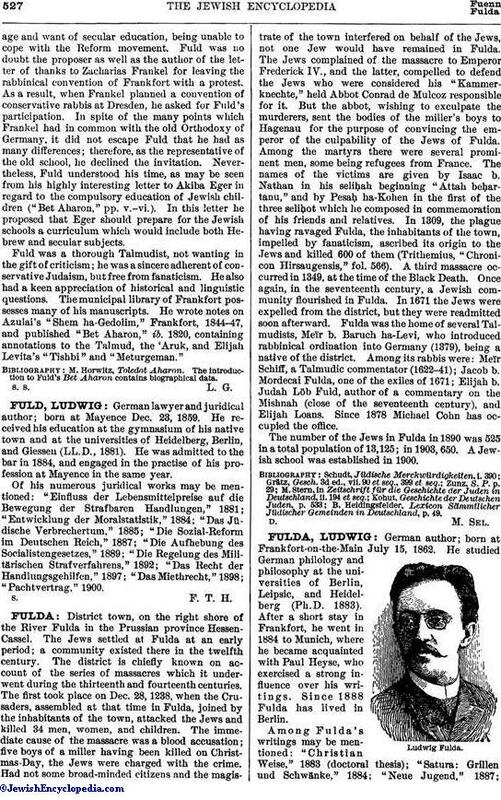 All that appeared in German in behalf of Orthodoxy under the name of Rabbi Solomon Trier was written by Fuld, the former, owing to his greatage and want of secular education, being unable to cope with the Reform movement. Fuld was no doubt the proposer as well as the author of the letter of thanks to Zacharias Frankel for leaving the rabbinical convention of Frankfort with a protest. As a result, when Frankel planned a convention of conservative rabbis at Dresden, he asked for Fuld's participation. In spite of the many points which Frankel had in common with the old Orthodoxy of Germany, it did not escape Fuld that he had as many differences; therefore, as the representative of the old school, he declined the invitation. Nevertheless, Fuld understood his time, as may be seen from his highly interesting letter to Akiba Eger in regard to the compulsory education of Jewish children ("Bet Aharon," pp. v.-vi.). In this letter he proposed that Eger should prepare for the Jewish schools a curriculum which would include both Hebrew and secular subjects. Fuld was a thorough Talmudist, not wanting in the gift of criticism; he was a sincere adherent of conservative Judaism, but free from fanaticism. He also had a keen appreciation of historical and linguistic questions. The municipal library of Frankfort possesses many of his manuscripts. 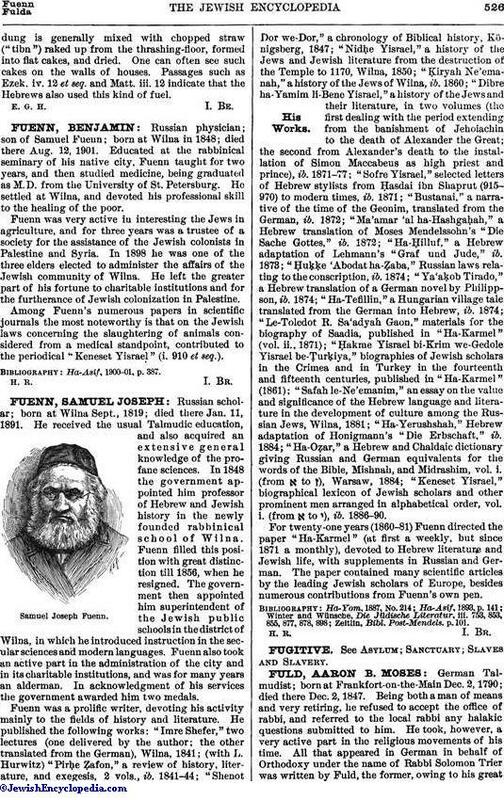 He wrote notes on Azulai's "Shem ha-Gedolim," Frankfort, 1844-47, and published "Bet Aharon," ib. 1820, containing annotations to the Talmud, the 'Aruk, and Elijah Levita's "Tishbi" and "Meturgeman." M. Horwitz, Toledot Aharon. The introduction to Fuld's Bet Aharon contains biographical data.